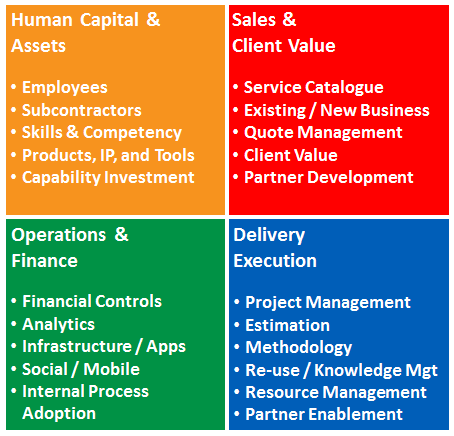 Regardless of industry served, all Professional Services organizations ("PSOs") operate in a continually changing business environment driven by economic, technology, and human capital forces, and share a number of common operational priorities. Seasoned Professional Services executives know that maturing processes and disciplined execution are central to addressing these challenges. To mature their operations and improve performance, many organizations are seeking unified platform Cloud solutions to provide the streamlined execution and analytics necessary to succeed in today’s volatile, high paced business environment. Others continue to leverage the strength and flexibility of Oracle E-Business Suite Applications. Whichever path you are on, Project Partners has the solutions you need to evolve your operations. Project Partners Services Resource Planning for Professional Services Organizations is a fixed price, rapid implementation approach for Oracle Cloud that provides delivers a rapid path to the Cloud with Oracle ERP, PPM and HCM applications. It delivers proven business processes and embedded analytics to PSOs. Created from Project Partners’ industry domain and Oracle technology expertise, this turnkey solution deploys an integrated, closed loop project and financial management platform using a template-driven approach for Professional Services firms. Project Partners leverages this solution to manage our own business. Technology advances are incorporated into our turnkey solution with regular frequency. Learn more about this solution. Learn more about our Professional Services extensions. Contact Us to learn how we can help your Professional Services organization. Increase revenue and margin with greater Sales and Delivery cohesion. This paper discusses how integration between sales opportunities and projects fully addresses the process facilitation and information flow required for maximum success. Beyond the sales process, seizing the opportunity to establish a single system of record for customer data that is used throughout the enterprise application architecture provides significant improvements in data quality, enterprise reporting and analytics, and data maintenance. Register and read it here. This paper details the business changes occurring in Professional Services organizations and gives Professional Services Executives two simple tools they can use to embrace the stretch they are experiencing. Leaders will gain more confidence in making decisions about what's right for their organizations and themselves personally. Register and read it.